Phoenix, Arizona (United States) – March 15, 2018 (travelindex) – When Best Western Hotels and Resorts launched a transformative brand refresh in 2015, the primary objective was to signal that Best Western is a contemporary and relevant brand, worthy of today’s travelers. It is also intended to enhance the brand’s image as an innovative, forward-thinking industry leader. Now, with the introduction of a “Today’s Best Western” campaign that will run throughout 2018, including a “Behind the Brands” series, travelers are getting a look at the evolution of this powerhouse hospitality brand. – Distinctive Brand Portfolio – To add to the iconic brands – Best Western®, Best Western Plus®, and Best Western Premier® – the company has launched eight new global brands since 2015. This includes a series of cutting-edge concepts catering to a new generation of travelers with the new-build Vīb® and GLō® brands, as well as soft brand options for most chain scale segments – upper economy and midscale (SureStay Collection® by Best Western), upper midscale (BW Signature Collection® by Best Western) and upscale and upper upscale (BW Premier Collection®). With a focus on providing unique, dual-branded properties combining the best of the Best Western Plus and Executive Residency by Best Western® brands. – Growth Around the World – In addition to an impressive pipeline of 296 hotels in North America, Best Western is also growing across the globe. In particular, Best Western opened nine new hotels in Asia in 2017 – with locations in Myanmar, Japan, Indonesia, Thailand and the Philippines. These have included two brands that are entirely new to the region – BW Premier Collection and SureStay Plus® Hotel by Best Western. The company received recognition as the “Best Debut Hotel Chain” at the 2017 India Hospitality Awards, with plans to open six hotels in India and three in Bangladesh in 2018. – Rising Guest Satisfaction – Best Western has enjoyed significant increases to guest satisfaction ratings in the past 10 years, with scores doubling since 2007. This stems from the award-winning I Care® Every Guest, Every Time hotel staff training program, the $2 billion spent on strategic renovations following the Design Excellence program and the rollout of the descriptor program. In 2017, Best Western announced an impressive 1,956 Best Western-branded hotels globally received the 2017 TripAdvisor® Certificate of Excellence recognition, yielding the brand’s highest level of guest satisfaction to date. – Continuous Innovation – With the 2017 global launch of the new Best Western Mobile Guest Engagement Platform – which includes web-based guest communications tools pre-arrival, on property and at check-out – Best Western continues to show its commitment to implementing new technology that enhances the customer journey. 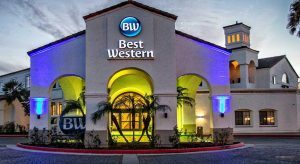 Named one of Fast Company’s Top 10 Most Innovative Companies in AR/VR for 2017, Best Western’s brand refresh has encompassed a number of technological advancements including the Best Western Virtual Reality Experience (BWVRE), which gives guests an immersive 360-degree look into all of the brand’s North American hotels – making Best Western the first major company of its size and scale to utilize this cutting-edge technology in this way. The reimagined BestWestern.com optimizes customer interactions across all digital channels, while incorporating highly visual, interactive elements. – Award-Winning Loyalty Program – Best Western has continued to make valuable enhancements to its award-winning loyalty program Best Western Rewards. By offering more rewards and recognition for Elite members and generous promotions for members of all levels, BWR’s membership has grown to more than 32 million members globally – representing gains of nearly 14 percent annually, since the beginning of the refresh. BWR achieved a top five ranking in U.S. News & World Report’s 2017-2018 Best Hotel Rewards Programs and runner-up status in WalletHub’s 2017 Best Hotel Rewards Program. With a goal to bring real value to today’s travelers with instant rewards and gratification, BWR offers a lower point level threshold relative to other hotel brands, enables members to redeem free nights at any of Best Western’s 4,200+ hotels worldwide, and awards points that don’t expire and don’t have blackout dates. On top of this, the newly unveiled Experiences by Best Western Rewards now provides members with exclusive, one-of-a-kind experiences in some of the most sought-after destinations around the world. – Awards Across the Board – Best Western continues to set industry records regarding awards and accolades. Several notable distinctions received in 2017 include: a Top Breakfast Ranking from J.D. Power’s 2017 Guest Survey; Best Western Plus and Best Western ranking number one in upper-mid-price and mid-price hotel brands respectively by Business Travel News®; 65 Adrian Awards for excellence in digital marketing, advertising and public relations; the company’s ninth consecutive AAA®/CAA® Lodging Partner of the Year award; and a gold Recommend Readers’ Choice Award in the Hotels/Resorts category. Today’s Best Western features 11 brands, each with its own logo and distinctive personality. The company’s new “Behind the Brands” series will dive deeper into each individual brand, further illustrating the differences for travelers. Best Western rolls out the “Behind the Brands” series later this month, with a sneak peek into the continued evolution of Best Western Premier.